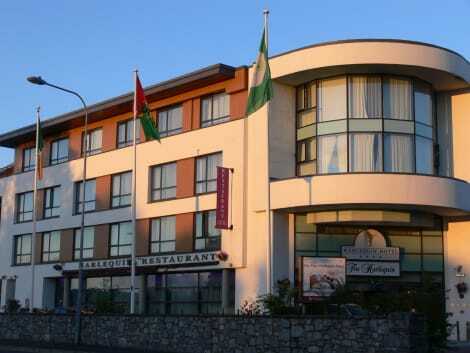 The 4-star Harlequin Hotel boasts 82 comfortable bedrooms and is situated in the heart of Castlebar Town. We offer large bedrooms with Hypnos beds and en-suite bathrooms as well as free internet access and seating areas with tea and coffee making facilities available in each room. Our rooms are decorated to the highest standard and come in a variety of palettes to suit all tastes. Located in Castlebar, Woodview Lodge Bed & Breakfast is a 5-minute drive from McHale Park and 6 minutes from Elmhall Graveyard. This bed & breakfast is 3.3 mi (5.2 km) from National Museum of Country Life and 3.6 mi (5.7 km) from Mayo Memorial Peace Park. Enjoy the confines of a luxurious, spacious home within walking distance of lively Castlebar (2km), at Doogarry House. 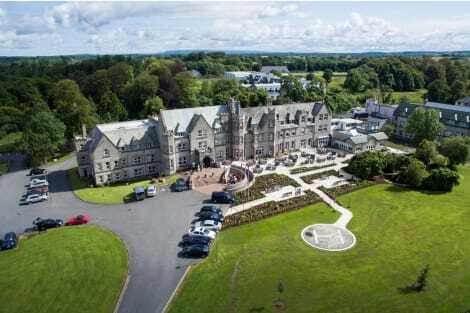 An ideal base for great golf, fishing, cycling and scenic walks, visitors can also explore the West’s renowned spots such as Connemara, Clew Bay, Knock and Ashford Castle. Spend an evening at the Royal Theatre or discover Ireland’s rural past at the National Museum of Country Life. Hosts Brendan and Bridget Cribbin offer superb local knowledge and a warm County Mayo welcome. Superbly located close to Castlebar (5km) and Westport, Millhill House is a cosy County Mayo haven. A luxury home with spacious rooms and private parking, guests are ideally placed to tour the best of the West including Clifden, Achill Island and Knock. Castlebar boasts the Royal Theatre and National Museum of Country Life, while in Westport guests can explore Westport House and Gardens and the acclaimed Great Western Greenway trail. Host Breege Scahill looks forward to welcoming guests. A modern, spacious two-storey bed and breakfast, Dun Mhuire is tucked away in a scenic country spot within walking distance of lively Castlebar, County Mayo. Guests can enjoy an evening’s entertainment at the Royal Theatre, discover rural Ireland at the National Museum of Country Life or take part in the town’s Four Day International Walking Festival, held every summer. A 30-minute drive from Knock Airport, guests are ideally placed to tour stunning Achill Island, Clifden and beyond. Private parking is available to guests. The town of Castlebar in the west of Ireland is home to some of the region's most historic sights, boasting a rich religious heritage and numerous churches. It is also a haven for walkers looking to experience the mythic Irish countryside, and plays host to a renowned walking festival. In more recent years, it has become a thriving cultural hub for the local region, offering hospitality and activities in equal measure. One of the first things you will notice upon arrival in Castlebar is the number of churches dotted around. With Church of Ireland, Roman Catholic and evangelical denominations represented, there is much here to interest students of religion. If you venture a little way out of the town, to the village of Balintubber, you will find Balintubber Abbey – rumoured to be the only church founded by an Irish King still in use today. Built in 1216, the abbey nevertheless boasts a number of modern additions, including a museum. Castlebar translated means 'Barry's castle', so it's not surprising to learn that the ruins of the 13th-century de Barry Castle lay in the town on Castle Street. Indeed, the military heritage in Castlebar is a strong one, being the site of the famous 'Races of Castlebar' during the 1798 Irish Rebellion. This was a comprehensive victory for the Irish and French forces, who were outnumbered by the opposing British by about three to one. Castlebar is set in some of the most beautiful countryside Mayo county has to offer. As such, it has always been a popular walking destination, and the International 4 Days' Walks Festival has become a national institution since its founding in 1967. Attracting people from all over the world, the 2015 walks range between 10 and 20 kilometres per day, taking in the rivers, mountains and crags of the region. Of course, this intensive pace is not for everyone, and you are free to explore the area whenever and however you want. If you would like to learn more about Castlebar and the surrounding area during your stay, the Museum of Country Life just a few miles outside of the town promises a thoroughly educational look at what life was like for local people in years gone by. In terms of present day offerings, the Linenhall Arts Centre features a packed programme of theatre, music, visual arts and more – pop in and see what's going on during your visit. The Harlequin Hotel Castlebar is one of the town's best places to stay, providing its guests with luxury rooms and helpful service. Numerous other Castlebar hotels and guesthouses provide a range of alternatives, ensuring you won't be stuck for somewhere to lay your head.